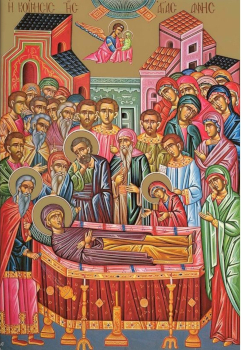 The Dormition of Righteous Anna, Mother of the Most Holy Mother of God. The God-wise, God-blest and Blessed Anna was the daughter of the priest Nathan and his wife Mary, from the tribe of Levi by descent of Aaron. According to tradition, she died peacefully in Jerusalem at age 79, before the Annunciation of the Most Holy Virgin Mary. During the reign of the holy Saint Justinian the Emperor (527-565), a church was built in her honour at Deutera. And emperor Justinian II (685‑695; 705-711) restored her church, since Righteous Anna had appeared to his pregnant wife. And it was at this time that her body and omophorion were transferred to Constantinople.